On Thursday, the new Chairman of the FCC Ajit Pai will hold a vote to repeal the core protections of the Open Internet Order. In the lead-up to the vote, telecom giants are championing an order that would give them more control over what happens on the Internet. On the other side of the debate is everyone else — start-ups, businesses, educators, artists, advocates, and people of all backgrounds who are defending net neutrality, the principle that keeps the Internet free of corporate control. They argue that net neutrality is necessary for American democracy and economy. But there’s an unexpected voice in the chorus: America’s faith leaders. Free speech, including religious expression, depends on the open Internet. The Internet has already become a prophetic platform for faith in the United States. Faith groups are using the Internet as a medium for spiritual life, service, prophetic leadership, innovation, and social justice. This would not be possible without meaningful net neutrality protections. A repeal vote would end all the Internet as we know it. The current net neutrality rules codify principles that have governed the Internet in the U.S. for decades. They ban carriers like Comcast and AT&T from blocking or slowing down websites at will – or charging websites money for access or a faster connection to their users. It keeps the Internet an open space for free speech for dissent, vital now more than ever. In this critical window, faith voices could help persuade Congress to protect net neutrality — not just as sound policy but as a moral imperative. Here are five reasons the future of faith depends on net neutrality. In a time when traditional religious practice is on the decline, new generations are finding meaning and community online. “The open Internet has become essential for 21st century religious and spiritual life,” said Brian McLaren, Christian author and thinker. “People of faith around the world are connecting, creating, praying, and organizing online.” In the U.S., online worship is vibrant in the United Church of Christ, Unitarian Universalist, and other denominations — a trend that is spreading around the globe. Online worship requires a fast connection. People cannot watch sermons, video chat with pastors, or participate in online study groups without it. But carriers want to set up special online “fast lanes” for websites that pay. These fast lanes would give websites a way to reach people faster. But most faith groups would not be able to pay these fees. Churches and other groups are already paying for their own Internet connection; they cannot afford a whole new set of fees to pay their parishioners’ carriers too. Left behind in the slow lane, it would be much harder for faith communities to gather online. Research shows that a slower connection speed even by 100 milliseconds causes people to click away. People who go online to watch a sermon will have to wait for the site to load and reload, making it impossible to experience faith on the Internet. Online faith communities won’t have a chance to grow. Online worship also uses a lot of data, especially anything that involves video. Carriers want to be able to accept payment from websites to exempt them from customers’ data plans. Websites that pay the fee would not use up people’s data while all other websites would. Commercial websites and others with deep pockets could afford these fees, but not most faith groups. Research shows that people prefer sites that don’t use their data. If people have to choose between watching a television show that doesn’t eat up their data or a Sunday morning sermon that does, faith doesn’t get a fair shot. Faith communities deserve the same chance at reaching people as corporations. We should continue to ban carriers from charging websites to enter a “fast lane” or to be exempt from data caps. This will allow us to explore the future of online religious and spiritual life. Faith groups are central to social safety nets. They offer soup kitchens to the hungry, coat drives and blankets in blizzards, and candlelight vigils in the wake of terrorism and other crises. They need the Internet to run these services and raise money to sustain them. In a time when extremist organizations are using the Internet to recruit and fundraise, faith communities need to be able to reach underserved communities, especially young people, as part of their mission. If the Internet becomes a place where you have to pay just to be heard, then the mainline church or the corner mosque that are providing community services will be forced to divert donations just to reach people online. As a result, carriers would be siphoning funds from the very civil society groups on the frontlines of fighting poverty, inequality, terrorism, polarization, and more. In a time when the United States faces tremendous social challenges, net neutrality ensures that faith communities can continue to use the Internet to serve the people. New generations of faith and moral leaders around the world are calling people to action through social media, blogs, videos, and online sermons. Such prophetic voices need protection — especially now. Americans who exercise their voices to challenge the status quo, especially those from marginalized or vulnerable communities, are already risking danger. They should not have to fear the Internet provider that carries their voice. But carriers want the ability to block and slow down websites of their choosing, or to exclude select websites from people‘s data caps. This gives them control over what we see and hear online, driving us to some voices and away from others. We have already seen examples in Canada, the U.K., and Germany, where carriers — intentionally or inadvertently — slowed down or blocked access to websites with content they disagreed with, including those that criticized their business practices. Carriers also want to exempt their own bandwidth-intensive apps but not those they see as competitors or threats. Net neutrality ensures that carriers that connect us to the Internet do not have the power to choose whose voice is worthy of being heard, and whose is not. We need to ensure that carriers cannot block, slow down, or otherwise disadvantage websites, including those who speak truth to power. We should also make sure that carriers cannot reach the same effect by exempting some websites from data caps. The Internet fosters innovation because people don’t need a lot of resources to launch a good idea. In the United States, many new faith-based websites for scholarship, community, and organizing were started by people without a lot of funding. I am one of them. In 2011, my team and I created a multifaith online organizing platform called Groundswell Movement at Auburn Seminary. When we started out, we needed the open Internet: We would not have been able to afford fees to enter a “fast lane” or to exempt our content from customers’ data plans. Today Groundswell has grown to a membership of 300,000 and supports a wide range of social justice campaigns as the largest multifaith online organizing force in the U.S. We were only able to reach people effectively because the Internet is an equal playing field. Net neutrality rewards good ideas, not deep pockets. It ensures that carriers don’t have the power to choose winners and losers online. We need to continue to protect the conditions that make innovation possible. They can ensure that innovation — not just in business but also in religious and interfaith life — has the chance to flourish. In this critical time, the Internet is a strong engine for grassroots social action. We should not need the approval of carriers to use the Internet as a platform for democratic discourse and action. The open Internet is the central infrastructure for social movements, now and in the future. It’s no wonder then that the Internet itself has become the primary tool for Internet freedom movements around the world — from the U.S. to India to Canada. In advance of the vote on the 2015 Open Internet Order, we sent in more than 4 million comments online to demand net neutrality, making the adoption of net neutrality one of the largest public interest victories in the U.S. Many more have weighed in to protect them this year. Yet the repeal vote on Thursday will end the protections millions fought to win. In a time when we most need it, ending net neutrality would drain the lifeblood from our movements, and silence prophetic voices from across the spectrum of faith. Congress can slow down the FCC vote or even force it to abandon the vote altogether — but only if they hear from enough of us. Half a million people have already called Congress. 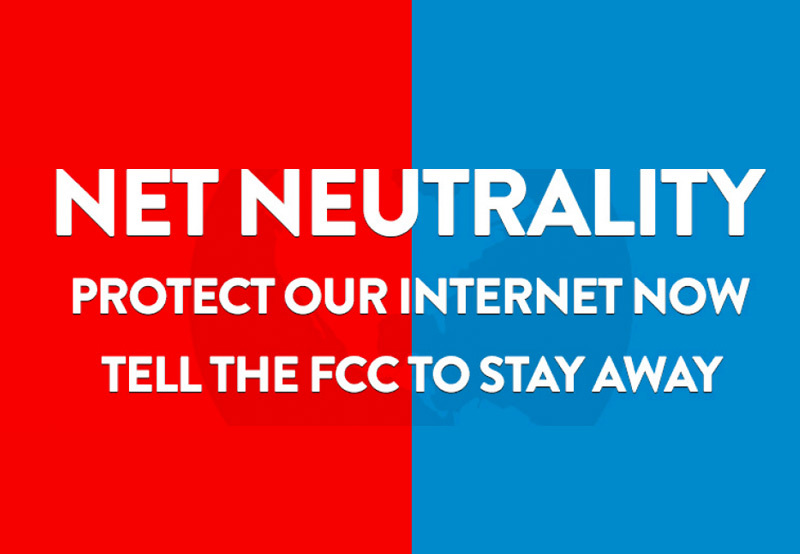 If you have never seen net neutrality as your issue before, now is the time. Keeping the Internet open is not only sound policy; it is a moral imperative. Valarie Kaur is a lawyer, filmmaker, and faith leader who co-founded Faithful Internet. This article was adapted from “5 Reasons the Future of Faith Depends on the Open Internet” published in Sojourners with Cheryl Leanza, policy adviser of the United Church of Christ’s Media Justice Ministry and co-founder of Faith. Valarie is an Auburn Senior Fellow.